Why be a journalist? It can be a difficult job with long hours, hard work and an uncertain future. Journalists face relentless criticism and an industry in transition. Aaron Chimbel has put together a collection of essays from working journalists who answer the question — why be a journalist? — with their personal stories of coming up, toiling in the field and writing important, career-defining stories. These journalists come from different platforms, beats and locations, offering varying accounts of the travails and rewards of being a working journalist across changing landscapes and timelines. 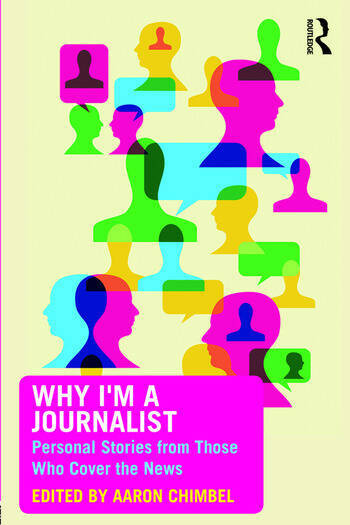 The essays in Why I’m a Journalist offer encouragement and wisdom about the path to being a reporter, a broadcaster, an editor or a media professional. This is a collection for students interested in the field, early upstarts engaged with building their careers and seasoned pros looking to learn from their colleagues. Aaron Chimbel is an associate professor of professional practice in journalism at Texas Christian University’s Bob Schieffer College of Communication, where he has taught full-time since 2009. "In an age of journalism demonization, this book is a tonic, a rich source of pride in the profession by some of America’s finest newsgatherers. It’s a book brimming with practical advice for journalism students and would-be reporters, but it’s also a wonderful reminder to those of us longer in the tooth that what we do, and what we train others to do, matters a great deal."